We had a great experience at the Argonaut Hotel. Loved the excellent location and the helpful, friendly staff. I highly recommend this hotel. Staff was very accommodating. So upbeat and attentive. Room was a little cramped but overall, happy with our stay. Great location - staff was friendly at the bar. My only complaint was when we arrived,, there was no bellman to help with luggage. Also I was with my partner and the guy at the front desk kept asking if we wanted to switch our King for two queen beds. It was uncomfortable but other than that it was a good hotel. Would probably try a different hotel next time due to price. Great location and very courteous staff. Would highly recommend this hotel for new comers to the town. Nice hotel and location! Great bed and pillows. Would stay again. Very good experience! The concierge staff was amazing, and the holiday music made the stay so good. room view wasn't as promised. cold breakfast. overpriced for room quality. Great location! Room kinda small, no view, but clean. Love the hotel had a wonderful time. Staff was very helpful and friendly. Only thing negative I have to say is our air conditioner broke every day we were there and I woke up every day to a 76° room. They sent someone to fix it each each but it continued to break which was very frustrating. We stayed for two nights. It is in a great location in Fisherman’s Wharf. The beds were comfortable and loved the crab and corn chowder at The Blue Mermaid. this is a very fun and interesting place with great service, excellent access to all the places you went to fisherman's wharf to be close to. It is also at one end of the Wharf scene so if you want to step away for a bit, it is not hard to get out of the tourist parade. 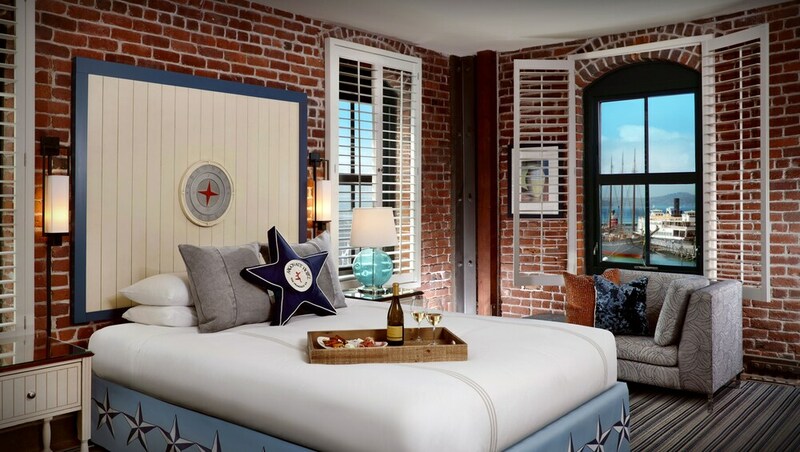 Located in North Beach, Argonaut Hotel - a Noble House Hotel is within a 10-minute walk of popular sights such as Ghirardelli Square and Aquatic Park. This 252-room, 4.5-star hotel has free in-room WiFi along with a fitness center and a 24-hour business center. Enjoy a bite to eat at the hotel's restaurant, or relax with a drink at the bar/lounge. Order from room service to satisfy your hunger without leaving your room, or meet other guests at the free daily manager's reception. For your convenience, breakfast is available for a fee. Guests can expect to find 27-inch a TV with a DVD player and a video-game console, along with free WiFi and wired Internet. Pillowtop beds sport premium bedding and the bathroom offers a hair dryer and designer toiletries. Other standard amenities include a minibar, a coffee maker, and a laptop-compatible safe. Guests of Argonaut Hotel - a Noble House Hotel enjoy a fitness center, free WiFi in public areas, and conference space. Valet parking is available for USD 85.50 per day, and there's also limo/town car service. The 24-hour front desk has multilingual staff ready to assist with dry cleaning/laundry and securing valuables. Other amenities at this luxury hotel include a 24-hour business center, free newspapers, and a ballroom. Hi I am so happy to hear your stay with us was outstanding and memorable. Please come visit us again soon. Hello. Thank you for your perfect review and for mentioning the Argonaut's legendary team. We hope to see you again soon. Hello, Thank you for your feedback and your stay with us aboard the Argonuat. We hope to see you on a return visit. Safe travels! Hi Christopher Thank you so much for staying with us here at the Argonaut and also for giving us such great feed back. I am sorry to hear there was no help when you arrived I will take a look in to what happened that day. Our restaurant team is top notch and I am happy to hear they made your stay with us memorable. Our rates do change depending on the season or if there are any convention in town. We do hope to see you return on your next visit. Thank you for staying with us we hope to see you come visit us again soon. Thank you so much for your wonderful review. It is very rewarding to know that you were captivated by our wonderful and welcoming fireplace. Happy Holidays! S, Thank you for your fantastic review. It is very rewarding to read such wonderful comments. Thank you very much for taking the time to provide us your insight. We hope you enjoy your time here in San Francisco. I am so excited you were able to experience all of the Argonaut's amenities as well as enjoy the knowledgeable service from our concierge team. Thank you for visiting us and I hope to welcome you back on a return visit. Guests can enjoy a free manager's reception daily. The Blue Mermaid Chowder - Restaurant and bar specializing in seafood and serving breakfast, lunch, and dinner. Kid's menu available. Recreation features at Argonaut Hotel - a Noble House Hotel include a fitness center. The front desk is open 24 hours a day. Driving? This property offers valet parking (fees apply), along with a car charging station. The pet fee will not exceed USD 250.00 per stay with 10% being donated to the SFSPCA. For more details, please contact the property using the information on the reservation confirmation received after booking.